Or do you have a child who would like to learn to play? Piano is one of those instruments that children can take-on at a fairly young age, sometimes as young as 3. Home recitals on mini pianos, electronic keyboards, or grandma’s old organ can lead to a true talent on the keyboard. Starting young is great, but if you didn’t have that luxury it is never too late to start. Our instructors teach a variety of styles, from classical to popular music. 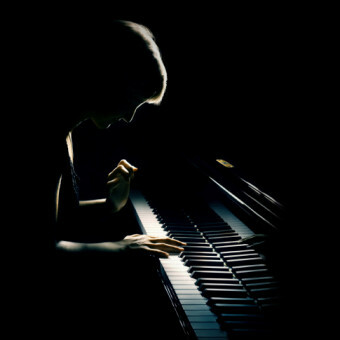 Whether you want to learn Bach or Alicia Keys, we will help you become the pianist you want to be. Members of our faculty have warm personalities and enjoy sharing their love for the piano with you. They will show you the fundamentals of sight reading, technique and theory, and they will also incorporate your favorite songs into your lessons. You do not have to have a piano at home to take lessons. A simple full-sized electronic keyboard will suffice for the first 6 months. If that piano is collecting dust at home, maybe this is your sign to give us a call and work with some of our wonderful teachers to help you or your child realize your full potential. We can instruct children to adults, beginners through advanced, classical to jazz, so contact DeAngelis Studio of Music to reserve your lessons today. Don’t forget to learn a little about our great piano and keyboard teachers. Click the photos below to get a taste of their experiences, skills, and passions. Among his many talents, Ian writes and records music, plays piano for a number of local artists, and is a Musical Director, teaching piano and guitar. Amanda is a high-energy, highly focused individual with an eye for detail and a taste for the unique, teaching all genres of music from Classical, to Pop, Rock, Jazz, and Blues. First learning piano at the age of five, Eric is well-versed in many music genres, and has an additional passion for songwriting and improvisational playing. Unique and energetic, Sarah helps students with their singing techniques, confidence, and range, and she will adapt lessons to their individual needs.